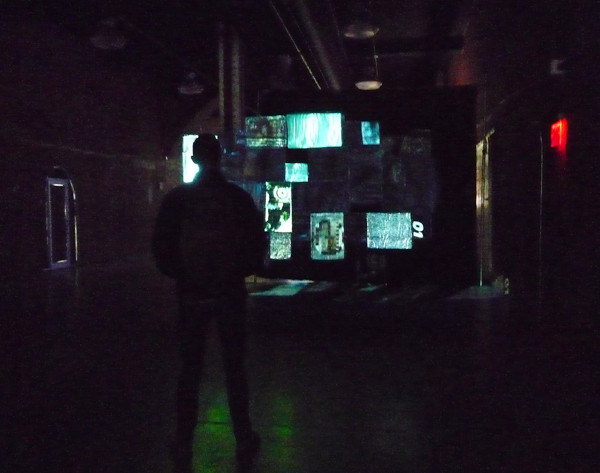 Daniel Canogar, Frequency, 2012, 33 analog television screens, projector, multimedia hard drive, 4:30 min. animation loop. Courtesy the artist and bitforms gallery, New York. The Moving Image Art Fair takes place at the Waterfront Tunnel – a wide-open corridor that gives works enough space to feel like a museum exhibition. Yet it’s not too big, offering ample opportunity to don headphones, sit, and take in the full length of any number of selections. More importantly, a few of the works give us something in addition to single-channel film or video art by thinking beyond the screen and incorporating the temporal and spatial dimensions of an image that moves… ergo, moving image. The fair opens with Spain Culture New York’s large-scale projection of Mateo Maté’s Heroic Acts, in which we observe from overhead a home environment in the shape of the map of Spain entirely dismantled and carted away. Made in 2011, in a short six minutes, it evokes the complete rupture of domestic stability as a result of an extended financial crisis. Further along bitforms gallery presents the work of another artist from Spain. In Frequency (2012), Daniel Canogar deploys 33 analog television screens as a quilted projection panel, which he animates digitally through a rhythmic choreography of the now obsolete analog visual white noise and television test patterns. 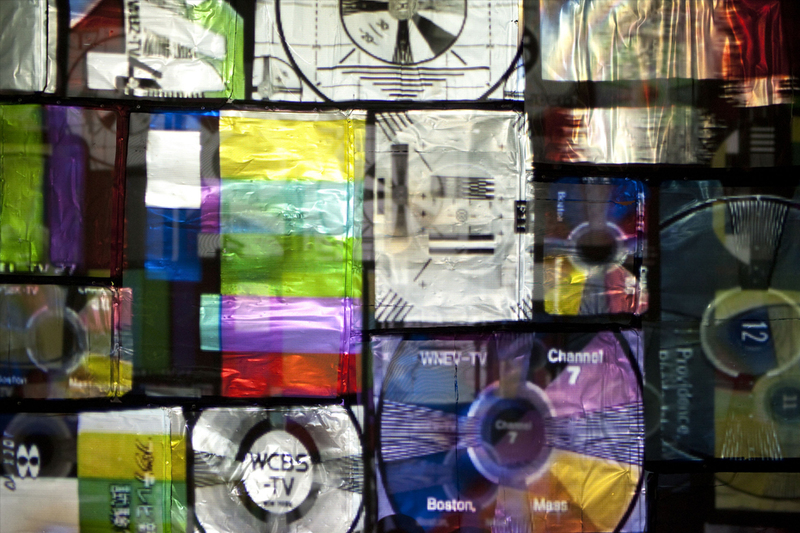 Daniel Canogar, Frequency, 2012, 33 analog television screens, projector, multimedia hard drive, 4:30 min. animation loop, installation view, Moving Image, March 6-8, 2014. Courtesy bitforms gallery. Photo by the author. Occasional color blips through the largely black and white abstractions while latent images emerge then slip away as if lost signals – technological cast-offs set adrift in memory’s dubious archive. And just as the frenetic scratches, waves, and dot-patterns of the white noise begin to resemble an Abstract Expressionist painting, a new wave of color text patterns take over in a panoply of coded armor reminiscent of Pop Art. Given that the rise of the AbEx movement coincided with the advent of black and white television in the home and Pop Art with the introduction of color sets, one can’t help but wonder how closely our aesthetic preferences resemble technological ones. 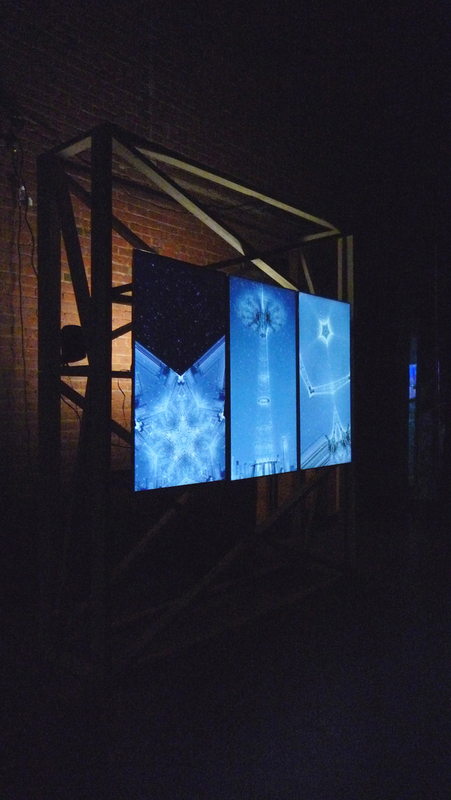 Leslie Thornton, Luna, 2013, 3-channel HD video, exhibited on 3 large-scale monitors mounted vertically on wooden structure, installation view, Moving Image, March 6-8, 2014. Courtesy Winkleman Gallery, New York. Photo by the author. Just beyond Canogar’s installation, Winkleman Gallery presents a work by Leslie Thornton, a seminal figure in experimental film. In recent years, Thornton has shifted venues from film festivals to gallery and museum installations. Astutely economical in form, Luna (2013) nonetheless claims for the moving image a complexity beyond the flat screen. Exhibited on three large-scale monitors mounted vertically on a wooden structure, Thornton’s kaleidoscopic dynamic turns a stationary Coney Island ride into a visionary pattern of complex relations: leisure economics and nostalgic play contests with a rapid fire display that stimulates both a sense of awe and vacancy: once again obsolescence yields as much loss as technological advantage. 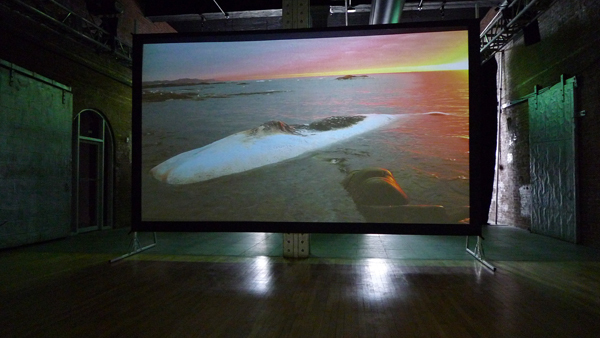 Patti Chang, Invocation for a Wandering Lake, part I, 2014, HD video, 11 min., installation view, Moving Image, March 6-8, 2014. 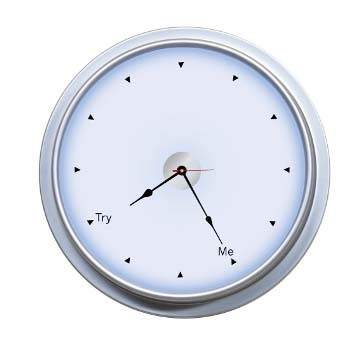 Courtesy of Creative Capital. Photo by the author. The passageway of the terminal ends with a dramatic, large screen expanse of a coastal bay dominated by the decaying corpse of a sperm whale. Though the subject of Patty Chang’s Invocation for a Wandering Lake, part I (2014) is somber – grotesque even – it has all the romantic beauty of the great landscape paintings of Thomas Cole, Albert Bierstadt, and Frederic Edwin Church. The undulating line of the sperm whale’s spine dominates the mid-ground but is repeated by the gentle wash of an in-coming tide whose motion modulates the rocks in the foreground while an opalescent light of dawn silhouettes the rise and fall of mountain peaks in the distance. Part of a more extensive performative journey, sponsored by Creative Capital, this component does not convincingly argue that the artist’s presence is necessary for the work to be recognized as a performance piece – the waves perform the ritual act of ablution more fully while the camera eye casts sadly over the whale’s demise… in emphatically moving images. • A millennial video by Liselot van der Heijden entitled Monument Valley III at Kent Fine Art, 210 Eleventh Avenue, 2nd Floor, pits a sublime landscape against John Ford movies (remember Natalie Wood as an Indian princess?) and a tourist culture that has demoted it to a scenic “view”… while a 1995 video by Muntadas entitled Siesta, Nap, Dutje literalizes the expression “arm-chair liberal” in a satirical implication of capital and laissez-faire policies. • Peter Campus opens his exhibition dredgers at Tierney Gardarin, 546 West 29th Street, Friday evening. As if these slow evolution “still” videos were moving paintings, the subtly changing digital compositions break up and reshape like pointillist brush strokes. It’s up to each individual’s perception to complete the image – questioning the relation between nature and the role we impose upon it. • Prior to the opening of Jim Campbell: Rhythms of Perception at the Museum of the Moving Image later this month, you can see three different sequences of his work – Topographies, Reconstructions, and Home Movies – at Bryce Wolkowitz Gallery, 505 West 24th Street – where the artist layers video with LED technology to create modulated mosaics of image and abstraction. • Similar to James Nares’ Street (2011) shown last spring at the Metropolitan Museum of Art, Hungarian artist Adam Magyar shows his black and white, 12-second take of commuters on a Tokyo platform filmed as the train pulls into the station. As part of a larger series entitled Stainless, the artist then slows the 12 seconds down to a mesmerizing 12-minute film that accents the three-person exhibition Metro at Julie Saul Gallery, 535 West 22nd Street, 6th Floor. • Two videos – Eight, Eighteen by Teresa Hubbard and Alexander Birchler – filmed ten years apart but now shown together – form a coming-of-age diptych narrative. The same actress – first as a child then as a young adult – expresses the apprehension and self-awareness of the events and spaces of one’s childhood as well as the influence of those who populate it. At Tanya Bonakdar Gallery, 521 West 21st Street, 2nd Floor gallery. • Jack Shainman Gallery, 513 West 20th Street, presents the US premiere of The Enclave, the six-channel video installation by Richard Mosse, who represented Ireland for the 55th Venice Biennale. Filmed in the Democratic Republic of Congo with a discontinued stock of infrared film, used originally by the military to detect camouflaged installations, the film stock’s altered color balance destabilizes preconceived notions of exotic milieu and violent brutality, while the shifting points of view established by the six-channel projection leaves the viewer complicit in the interpretation of events. • This year, Moving Image collaborates with Eye Beam to present Second Sight: an exhibition of new approaches to video; Eye Beam, 540 West 21st Street, Thursday – Saturday noon – 6 pm; Sunday 11:00 am – 4:00 pm. • And, finally, for those venturing uptown: there’s always the biennial within the Whitney Biennial – that is – the third floor curatorial selection of installation and new media art by Stuart Comer, formerly Curator of Film at Tate Modern, London and now Chief Curator of Media and Performance Art at MoMA. It’s a densely installed chaotic mix that’s intriguing!